"Everyone should have a musical family." The Orchard has revealed a trailer for a new music documentary called Living on Soul, looking back at the historic Daptone Records. The film is made up mostly of footage from their three-night, sold-out residency at the historic Apollo Theater back in December of 2014, as well as footage from their European tour and other interviews. Some of the key names from Daptone Records include Charles Bradley, Thomas Brenneck, and Sharon Jones. This doc project was also funded on Kickstarter, and co-director Jeff Broadway provides an extensive behind-the-scenes look at how they filmed this and how it all came together. Looks like a groovy, historic music doc filled with plenty of funk and soul. Filmed during their three-night, sold-out residency at the historic Apollo Theater, this hybrid docu-concert film features the late great Sharon Jones, Charles Bradley as well as the rest of the Grammy-nominated Daptone Records family. 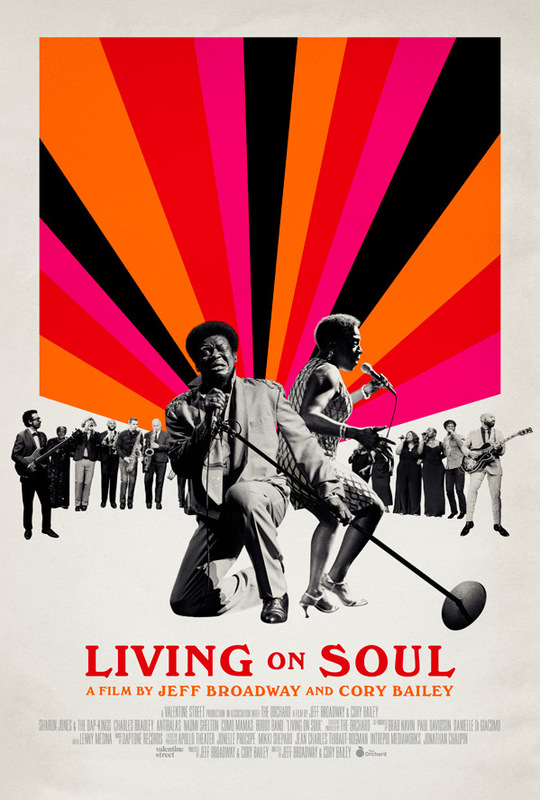 Living on Soul is co-directed by filmmakers Cory Bailey & Jeff Broadway (of Our Vinyl Weighs a Ton: This Is Stones Throw Records, Godspeed Taiwan). This doc is premiering at the Philadelphia Film Festival this month, but hasn't played at many other fests. The Orchard will then release Living on Soul in select theaters + on VOD starting December 5th this fall. So who wants to see this doc?